I recently found out about another unjust NHS unfair dismissal case, that of Debbie McCoy, and I have told her story on the Stories of NHS Staff page of my website. She worked as an art therapist in the north of England, felt herself bullied and harassed, with little allowance for her disability (dyslexia). The Tribunal was severely critical of the behaviour of certain managers in the Trust. Just as in so many other cases, Debbie did not have the financial resources to fight her case all the way and she had to settle for relatively limited compensation, and no recovery of her legal costs. Another thing she had to endure was hostile cross-examination during the Tribunal hearing. This is something that the legal profession needs to address in due course. Hurricane Sandy upset the broadcast schedule of radio programmes on the East Coast of the USA at the end of October, which meant the postponement of the broadcast of my interview by the USA National Whistleblowing Centre. I have made a number of additions to my website, and so it may be worth anyone having another look at it again. I am hoping to set up a fund to help healthcare professionals who have suffered distress, such as ill-treatment by NHS management, and there is a place to ‘register interest’ while the fund gets set up. Too many staff have just had to cave in because they could not afford the huge legal costs, whereas NHS managers seem to be able to spend whatever they like on legal expenses. This is disgracefully unfair. On Nov 3-4, I attended the annual meeting of the British Association of Physicians of Indian Origin (BAPIO), which was held in London. The first day of the two-day meeting took place in a conference suite within the Wembley stadium. 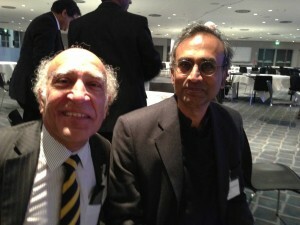 Eminent speakers talked about a range of topics, including the impact of the NHS reforms. Attending the meeting was the Indian Nobel Laureate, Sir Venkatraman Ramakrishnan, who works in Cambridge. He is a close friend of many BAPIO members. The phrase ‘pleasure and privilege’ is perhaps a bit of a cliché, but in this case for me it really was a pleasure and a privilege to be able to talk with him during the meeting. He is a truly inspirational and wonderful person – there was not a single person at the conference who was not moved by his presence on the day. He sat at our table for part of the meeting, and this is a photograph of him with me at the table. At the BAPIO meeting, I met a number of kind and supportive Indian doctors. Out of the blue, when I was sitting at my table, a consultant neonatologist from Oxford came over and told me he had seen my website, and that he admired my campaign and sympathised with the distress and loss that I had suffered. It is moments like that help to give me the strength to keep me going. It was clear from a number of speakers that the mid-Staffs Hospital Public Inquiry Report may well help to generate a number of changes in the NHS. One of the doctors at the BAPIO meeting, a medical director, mentioned how nine doctors have committed suicide after having been reported to the General Medical Council. That led to a comment by another Indian doctor that such suicides should be formally classified as ‘Never Events’ (a term usually retained for describing serious medical errors that should never have happened). It just so happened that I had made a similar proposal on the Towards A Better NHS page of my website. One could argue that if an NHS Trust or other NHS body is willfully negligent by wasting more than £100,000 on expenditure such as needless legal proceedings, this should also be classified as a ‘Never Event’. Gandhi was mentioned several times on both days at the meeting. I have decided to make my Gandhi booklet freely available for download from my website, and you can see it here (Download booklet). It is essentially the same as the Cambridge Happiness Manual, but has 20 Gandhi quotes on the inside front page. A piece of good news is that the other Indian consultant at Addenbrooke’s who was sacked around the same time as me, Dr Patrick Bose, won his case at a recent GMC hearing, and this story was reported in the Cambridge Evening News (Download article). A correction to the published story is that the article states that he was ‘struck off’, but this is wrong and what it meant is that he was dismissed by management at Addenbrooke’s. The case of Jimmy Savile has been in the news in the past few months. Although his case is very different in many ways to the wrongs in the NHS, there are a few similarities – suppression of news of alleged ill-deeds, the fact that generating lots of money somehow protected an individual from criticism, and the ‘system’ preventing the truth from being told – in his case elements of management in the BBC, and in the case of the NHS elements of NHS management. One of the main challenges my colleagues and I face in our campaign is being able to stimulate and inspire others. There is a natural feeling – ‘What’s in it for me…Do I really want to take risks in getting involved?’ I trace this attitude back to ‘self-preservation’ instincts and people being worried about their self-image. On the front page of my website I have a picture of Edmund Burke, and his quote, The only thing necessary for the triumph of evil is for good men to do nothing. There is another, even stronger quote which I hesitate to mention, but here it is! It is by Dante Alighiere (1265-1321) who was apparently an Italian national epic poet. The darkest places in hell are reserved for those who maintain their neutrality in times of moral crisis.